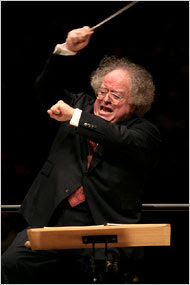 In an article titled Leave James Levine aloooooone (yes, I counted the 'o's), Paul Wells discusses the current backlash against an ailing James Levine. Discussing a Jeremy Eichler Boston Globe article as "a cranky year-ender", Wells points out that Eichler's theme is that Levine’s “larger artistic vision” is lacking. In addition it seems that Eichler wrote a similarly lamenting piece a while back, when 28-year-old Gustavo Dudamel started in Los Angeles and 42-year-old Alan Gilbert in New York. Anthony Tommasini joined the chorus in the New York Times saying there was “an artistic quandary” in Levine’s leadership. In the opinion of Yours Truly, comparing Levine and Dudamel is certainly like comparing a Cadillac and a Porsche. One is built for comfort and one is built for speed. One is built for long, level rides while the other is built for boisterously dashing about. Let me be clear; I am not in any way denouncing Dudamel's genius. His conducting and manner with an orchestra is certainly beyond compare. But, let's not forget that Levine made his debut conducting at the MET some 10 years before Dudamel was even born. Levine, too, was 28 years old. The most exciting dividends came from Levine, who conducted the Dallas Symphony this season. His baton technique is clear; his rhythms radiate flexibility; and he brought to Tosca a dramatic tautness frequently missing in the Met's pit. Brass often came to the fore to emphasize Scarpia's cruelty; many of the score's instrumental details received a new focus. Levine should have a great career ahead of him; the Cincinnati-born maestro at only 28 had obviously won the respect of the choosy and temperamental Met orchestra. 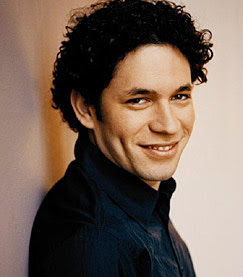 I ask you friends, why are we even questioning Levine when we should clearly be questioning the rising young-uns like Dudamel? To me, the question is not whether or not Levine's "artistic vision" is lacking or whether or not there is “an artistic quandary” in Levine’s leadership. Indeed, the question should be: does Dudamel have what it takes? Does Dudamel have the kind of potential for achievement and maturation that Levine has proven to possess over the last 38 plus years? Leave James Levine aloooooone by Paul Wells of MACLEANS. Jeremy Eichler's Boston Globe "a cranky year-ender". Anthony Tommasini piece including the “an artistic quandary” in Levine’s leadership is here. The Speight Jenkins, Dallas Texas Times Herald quote comes courtesy of the MET Opera Archives. However, I'm reminded of Bruno Walter's career. Certainly the recordings he made at the end of his life were solid, but it's the post-Mahler-apprenticeship period that most consider the best, most exhilarating. It's a shame that recording technology at the time was horrid and much of it is either missing or of a highly warped nature from the concerthall. I guess it's my roundabout way of saying: Sometimes there's just no substitution for a Porsche!